As the monarchs make their migration to Mexico, we reflect on another exciting year of Monarchs for Kids and eagerly look ahead to the next year. This year we served roughly 124 classes in 36 schools, preschools, day care centers, and nature centers. This is an amazing feat considering we began the program in 2013 by spending $100 to supply Wingra School with a mere 12 painted lady butterflies! 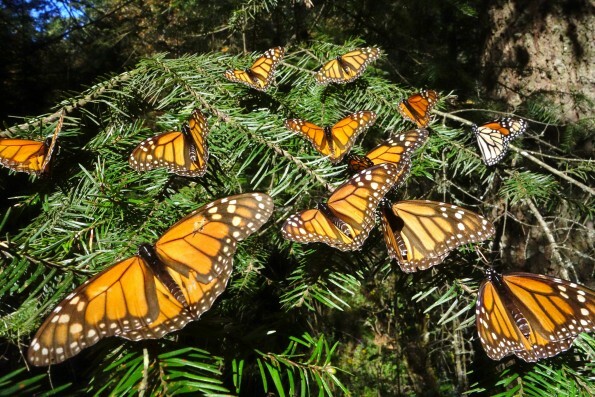 With the positive feedback we received from the Wingra School experience, we thought: “If we raise butterflies ourselves, it will be more affordable AND allow us to serve more schools.” We switched to monarchs because their lifestyle is awe-inspiring and their population is crashing. So, the next phase–Monarchs for Kids–began. Every year our primary focus has been the same: to promote environmental stewardship and awareness in children’s lives through hands-on experiences. Since teachers require support, we provide eggs, equipment, manuals, teacher workshops, milkweed plants, exchanges with classrooms in Mexico, and milkweed food for monarchs in the classroom. little caterpillar home with them each afternoon. Photo by Michael R. Anderson. During the summer, we raise monarchs for the upcoming school year. But just as important, we utilize summer events to recruit and train new teach­ers and the volunteers on which the program depends. This past summer, we brought monarchs to 21 events, including the Monroe Street Festival, Butterfly Action Day, and neighborhood picnics. At the Festival, the tame butterflies we released lingered in the area, saying “hello” to pedestrians and tasting flowers in front of stores. Looking ahead to 2018, the Monarch for Kids program will experience some changes. Up to now, I have coordinated the program, thankful for the help of many talented volunteers including Jessy Rowe, Amy Callies, Bonnie Wiesel, Dawn Daley, Julie Rothwell, Diane Drives, Karen Faller, Melissa LeBlanc, Kevin Thies, Jodi Pahs, Nick Sanek, Mischa Wagner, and Tom Hemaidan–to name a few. Next year, I no longer can continue the same intensive level of involvement, so Friends of Lake Wingra will help us transition to a more sustainable structure. In 2018 a grant from the Besadney Foundation will allow our Program Manager, Casey Hanson, to provide planning, publicity, communi­cation with schools, and coordination of volunteers. 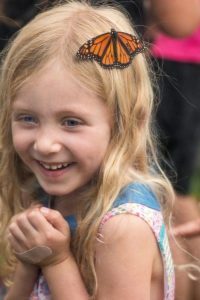 During this time, Friends of Lake Wingra will create an operating frame­work to ensure the long term success ofMonarchs for Kids. Two crucial components of this are to have (1) a point person for each participating school and (2) neighbors and parents to help deliver eggs to the schools and bring food for the caterpillars. During the summer we need volunteers to breed butterflies (and kids to feed the laying females), families to raise eggs, helpers for public events, and butterfly gardeners. Pick a role and join the crew! Each year, learn something new about monarchs.